In her work, van Genderen explores elements of narrative, illusion and figuration within the framework of abstraction. One can say that the artist allows the surface and material to narrate the picture plane, rather than a subject. In one work, there is silhouette of a flower the way Matisse would paint it, but in the next she uses elements of the typical style of Mark Rothko. The artist is having her first solo exhibition at Galleri Brandstrup Fall 2014. 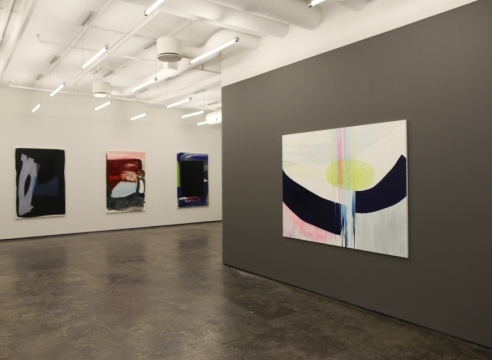 Her abstract and non-figurative paintings shows a spatial complexity achieved only through the play of light and color. The surfaces in her paintings are alternately transparent and reflective, and a closer look reveals occasional matte areas, which define the physical surface on which she works. The various levels of transparency and reflection are achieved through different types of paint: oil, enamel and alkyd. Her color choices range from organic to synthetic – from the pastoral colors of the garden to the neon lights of the nightclub. Her relationship to art history also goes further back; in 2011, she held a show at Galerie Michael Janssen in Berlin, Germany with the title The Gentle Art of Making Enemies. The title alludes to the book of the same name by the great painter James Abbot McNeill Whistler. It was first published in 1892 and is an account of personal revenges between Whistler and the art critic John Ruskin who criticized Whistler‘s beautiful painting Nocturne in Black and Gold. Ruskin called it “unfinished” and as “flinging a pot of paint in the public’s face”. The painting was pointing towards what would happen with the nonrepresentational painting and the book an historical document that helped in shaping the modern feeling toward art in the 19th century. Monique van Genderen has been represented by Galleri Brandstrup since 2010.